“This is not to be construed as MIT Lite or Harvard Lite,” Reif says; whether or not these edX programs will live up to the hype, however, has yet to be seen. On May 2, YouTube user “EdXOnline” uploaded a video entitled “edX: The Future of Online Education is Now.” The video, a two and a half minute trailer for the $60 million open source online education platform jointly overseen by Harvard and MIT, hit over 150,000 views within weeks. In the video’s opening statement, L. Rafael Reif, President (then Provost) of MIT describes the project in these terms: “so novel,” “so new,” “so different,”“very exciting,” “very scary,” and “potentially disruptive.” Behind these comments, instrumental music plays—the kind you would expect to inspire a younger generation, and more non-profit anthem than superhero theme song. The possibly disruptive implications of edX have been of particular interest to media outlets and educational commentators, inspiring evocative headlines like“Online Classes Cut Costs, But Do They Dilute Brands?”(NPR) and “Will edX Put Harvard and MIT Out of Business?” (Forbes). In the five months between the announcement of edX and the launch of the first-ever HarvardX courses in October (CS50x: “Introduction to Computer Science,” and PH207x: “Health in Numbers: Quantitative Methods in Clinical & Public Heath Research”), the term “MOOC” (massive open online courses) has gained traction in the media and blogosphere. Speculation about whether MOOC-generated textbook sales might provide a vital boost to publishers has occurred alongside philosophical debates over the merits of the traditional four year university. The edX initiative stands to join the ranks of major MOOCs like Coursera and Udacity. Like its competitors, edX intends to make knowledge available to more people. But unlike these, edX is a not-for-profit, designed with the hopes of acquiring and employing data and research about effective teaching and learning methods. Students of edX will split their class time between watching short lecture modules (around 10 minutes or so in length), performing interactive activities, and asking questions to each other and TFs in online forums. With the combined prestige of MIT, Harvard, and UC Berkeley, which joined the edX initiative in July, edX will likely have little difficulty attracting students from around the world. Proving that these courses can overcome existing limitations of online education, however, will be a defining challenge. Preserving the prestige and branding of Harvard and MIT will also be a major concern, in addition to figuring out how to prove that HarvardX and MITx are more than just online spinoffs of their on-campus counterparts. “This is not to be construed as MIT Lite or Harvard Lite,” Reif says; whether or not these edX programs will live up to the hype, however, has yet to be seen. There is a pervasive, even unsettling optimism associated with the concept of open-source knowledge. It is an unexpected optimism, the kind of overflowing exuberance and youthful naivete that 20-somethings espouse in TED talks and the like—the kind that causes the worldly middle-aged to roll their eyes. And it is unexpected because it’s this older generation that is the face of this new optimism at edX, not the young firebrands of the post-Internet Explorer age. “This is the single biggest change in education since the printing press,” says edX President and MIT professor Anant Agarwal in the aforementioned YouTube video promoting the new platform. “Our goal is to educate a billion people around the world.” These might be the words of a publicist or a speechwriter; and yet they might also be the sentiments of those who are deeply, sincerely hopeful about the progress of education. It’s an attitude that we’ve seen before, albeit a couple hundred years ago. “One cannot go too far in making the means of acquiring an education as easy as possible,” wrote Jean-Baptiste le Rond d’Alembert, who, along with Denis Diderot, edited the “Encyclopédie,” a 1751 Enlightenment text that tried to encompass all of human knowledge in order to make it more accessible for more of the public. The 17th and 18th century European intellectual movement might in some ways be seen as a precedent to today’s emerging digital Enlightenment, not least in their epic ambitions. Both then as today, there was the seemingly unlikely confluence of elite support for an ostensibly populist sentiment—one that also found its way into the rise of a fledgling nation of the late Enlightenment: the United States.“George Washington wanted to establish a national university. It was never done, but it was his wish,” says Engell. “His farewell address also contains an interesting section on the need for the diffusion of public knowledge and education...It’s one of the reasons why I think America was able to come into being.” As the first American university, perhaps it’s fitting that Harvard will be a part of realizing and extending Washington’s dream on a greater scale than ever before—creating an internationally accessible university that doesn’t just aggregate information, but innovates in the field of online learning. Monika A. Lutz, who will graduate from the Extension School in November 2015, is one of the most passionate members of this audience, the success story of the student who takes advantage of the opportunities of online education—an exception, perhaps. Lutz has completed a semester’s worth of credits, but she first stepped onto the Harvard campus this fall: Over the past two years, Lutz took four online courses from Shanghai, Singapore, and Washington, D.C. While abroad, Lutz was one of the Harvard Extension School’s nearly 5,000 students who can choose from over 200 online courses, plugging herself into an academic community via the internet. For Lutz, taking courses remotely provided for an even more productive education. Gushing about her “real-time” education, Lutz’s rapid-fire speech matches the pace of the internet generation to which she belongs. “It’s just-in-time education, just-in-time information; I’m learning what I need to know and immediately applying it.” These distance classes allowed her to explore options, says Lutz, who held internships at Congress, the EU Delegation to the United States, an international pharmaceutical marketing firm, and with a fashion designer during her gap years. Because of this, she knows the concentration she wants to pursue: Government, with a double secondary in Mandarin and International Business. Lutz is emblematic of the culture of lifelong learning that edX hopes to foster. Though the courses she took weren’t strictly MOOCs—Extension School students must be accepted in order to enroll—the outcome of these online courses is similar: blurring the line between where student life ends and a professional life begins. “It really encourages lifelong learning, because you’re balancing education and your personal life,” says Lutz. Not everyone, though, buys into the hype. HarvardX might not provide a concrete answer to the question of whether online education is the best way to learn, but Faculty Director Robert A. Lue stresses that the initiative is aimed towards rethinking the most effective ways to learn and teach. 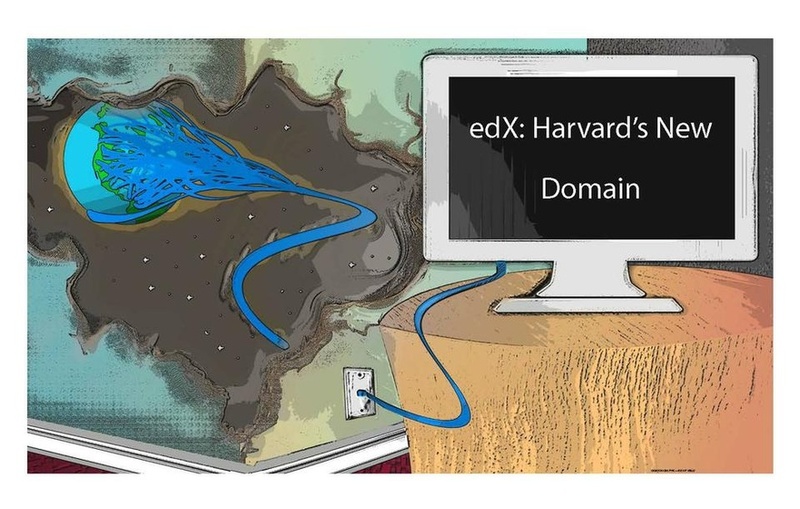 HarvardX, Harvard’s branch of the edX platform (which also supports UC Berkeley and MIT), is designing classes that demand active participation and pointedly break away from the recorded-lecture model. Unlike the MOOCs that precede it, HarvardX is a fundamentally creative venture, says Lue. He stresses that HarvardX will be beneficial not only for distant students, but for its on-campus community as well. “It’s not about just putting courses online, it’s about how we use technology delivered via the internet to be more effective—using tutorials and videos to teach on campus as well,” he says. Lue emphasizes that this close evaluation of the learning process is what makes HarvardX’s approach to online education unique. “Platforms [like Udacity or Coursera] don’t really think about how it comes back to their campuses, but we are both external and deeply internal.“ Lue cites the potential for personalization and flexibility within HarvardX courses. “We’re really in a research-based, cyclical process....It’s a broader impact on higher education,” he says. When HarvardX launches in less than two weeks, it will explore the advantages of online education with students around the world. However, the College is already experimenting with online education for undergraduates on-campus. Professor Ali S. Asani ’77, chair of the Department of Near Eastern Languages and Civilizations, is teaching a General Education course this semester called Culture and Belief 19: “Understanding Islam and Contemporary Muslim Societies”; Asani has taught this course in four previous iterations, but this time, he has added online-only sections that change the dynamic of discussions. “If you look at the profile of online students, they’re not the typical Harvard student: There are business people in there, there’s a fighter pilot from Afghanistan who works for the US Air Force there, there’s a housewife from Abu Dhabi, two people from South America, somebody from Calgary, somebody from Vancouver. It is a really diverse kind of a group,” says Asani. This is the first time that a General Education course offered at the College has offered online sections, according to Asani, who feels that this course, because of its focus on international societies, is particularly benefited by online sections. Although Asani felt strongly that these sections would enrich the course, members of the administration were initially hesitant. “I had to struggle to get approval for this. People were wondering about its impact; there was a great deal of caution about whether the College would appreciate this,” Asani says. Thus far, Asani has been optimistic about online sections and has received positive feedback from teaching fellows who led the first sections of the course in September. Using video conferencing technology, the sections function largely like on-campus sections. In fact, Asani argues that online sections have certain technical advantages over their in-person counterparts. He gives the example of breaking sections into smaller discussion groups during class: With the click of a button, he can sort students into groups and allow them to discuss in private virtual classrooms, without the shuffling chairs or distracting white noise generated by neighboring groups’ discussion. Although there are clear benefits to diversity in the classroom, the limited student response to online sections suggests that this experiment is still only an experiment, and that students are not quick to embrace changes to the traditional, cloistered undergraduate section. Contrary to Asani’s expectations, the majority of undergraduates opted for on-campus section when offered the opportunity to take section online. The novelty of online sections might account in part for the subdued student response, but another underlying reason may have todo with Harvard’s elite image, which could be seen as being threatened by the expansion of sections to non-undergrads. Harvard admissions literature frames the discussion section as a special partof the Harvard experience, but is it as special when seen through a computer screen? “Harvard’s challenge and MIT’s challenge is going to be to maintain the elite brand at the same time that they massify—that’s what the ‘X’ does, which is say that this is Harvard and not Harvard,”says P. Marc Bousquet, an English professor at Emory University and a contributor to The Chronicle of Higher Education. Maintaining brand prestige is an unavoidable topic when discussing how Harvard operates, but here it’s an especially complicated one because of the conflicting pedagogical and financial considerations at play. Down the river, the breaching of the line separating Harvard from the outside world might be unsettling for students, when the exclusivity of a Harvard education is no longer bounded by the gates to the Yard. “[Online students] are working people, professionals who are motivated or in some cases even more motivated than undergraduates, going out of their way to take these courses. It’s not on their doorstep, as it were,” says Asani. According to Bousquet, the model of edX reflects current trends which apply business organizational models in order to increase the scale of open access education. This in turn can be traced back to the educational policy decisions of U.S. Secretary of Education Arne S. Duncan ’86. “Arne Duncan and the partnership [between HBS and HGSE] is overtly and unapologetically committed to trying to use methods from corporate America, including downsizing and outsourcing and so on, to scale up and reduce costs and increase their version of quality,” Bousquet says. Bousquet also points out that edX does indeed have multiple missions, and that attention from the media on the “democratization of knowledge” might inadvertently cause the general public to overlook these other goals. There is no free lunch, Bousquet’s statement suggests, and the price of admission for access is not just the cost of connecting to the internet, but also permission for Harvard to use participants as educational guinea pigs. Bousquet notes that although edX will have advantages from its nonprofit model, it will have to more persuasively address where HarvardX stands in relation to Harvard, and MITx to MIT. Lue, however, stresses the faculty’s commitment to keeping these HarvardX courses top-notch. “The content will be there, but can we give students the experience of going to brain break in the dining hall of Kirkland House? Probably not,” he says. Both recognize that the online experience is a trade-off. “But to complain that it’s not fully democratic—we’re certainly less democratic now [than we will be with HarvardX]. And we’re far closer to being democratic than we ever have been before,” Lue says. Professor Marcello Pagano, who teaches at Harvard’s Schoolof Public Health, says that, in a way, he’s been preparing to teach his first edX course for 10 to 15 years. He sees this class as a natural continuation of his teaching career, and Harvard and HarvardX as complementary but not competing. “What’s happened now is that it’s sort of perfect storm,” he says. Pagano’s course, PH207x: “Health in Numbers: Quantitative Methods in Clinical & Public Health Research,” co-taught with Earl F. Cook, a professor of epidemiology, will cover “the principles of biostatistics and epidemiology used for public health and clinical research,” according to the edX website. Classes run from Oct. 15 to Jan. 18, and the “estimated effort” involved is listed as 10 hours per week. “A sound grasp of algebra” is the only prerequisite. The edX technology, Pagano explains, allows each student to have total control of the speed of every segment. Students will be able to pause, rewind, replay, even play the segment at up to 1.5 times the original speed. “You don’t sound like a chipmunk—it’s not a fast forward—but it’s at a faster speed so you can knock off a third of the time. You’ve got a lot of control over the delivery of the material,” Pagano says. “What these HarvardX tools will allow us to do on campus are spend more meaningful time doing the things that are dependent on face-time,” says Lue. He cites the “flipped classroom” theory, sometimes called “reverse teaching,” in which this new technology allows students to learn and process information by themselves from a pre-recorded lecture, and then use class time applying this understanding in the presence of their teacher. According to Lutz, face-time isn’t always as valuable as it’s made out to be. “You know, how many of my classmates sat there in class last night and didn’t ask a single question—while the students online were sending their questions in, and the professor knows them through that?” Since arriving on campus, Lutz has met all of her former professors in person, and has had many say they recognized her and remembered the questions she posed online. Yet, Lutz’s efforts to meet her professors indicate the inherent value of personal contact. Online learning, then, leads to a counterintuitive outcome: Maybe a remote education can sometimes be a more personalized one. EdX, Pagano suggests, could replicate the one-on-one teaching experience, but on a massive, previously unfeasible scale. In contrast to Lue’s consideration of HarvardX’s impact on the immediate campus community, Pagano also focuses on its potential for far-reaching influence. He speaks of plans he’s developing with a former Rwandan student and teaching fellow to broadcast HarvardX courses in Rwanda and develop a program whereby students could attend sections with a teacher to receive credit at local universities there. Elsewhere, edX has already begun to draw out the most promising thinkers of the next generation of students. Pagano cites an example of a student who received 100 percenton all of the assignments in the prototype edX course, MITx6.002x: “Circuits & Electronics.” He was a 15-year-old student from Nepal. Although edX is still a work in progress, the media attention it has drawn to itself and other MOOCs have attuned students and faculty members to the elements that differentiate their on-campus education from online education, as well as the possibilities of incorporating online education into the on-campus experience. Commentators will continue to debate the relative merits and demerits of both, but, in a way, the two might ultimately be apples and oranges. For all the excitement that Pagano shows for the upcoming launch, he still appreciates certain aspects of the traditional in-person model.